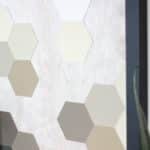 Do you have any walls in your home that just need a little something. When we were working on our Modern Living Room reveal, we had one very bare wall. I couldn’t just leave it like that! So I came up with a few DIY wall art ideas, and made it into a cut little corner for the time being. 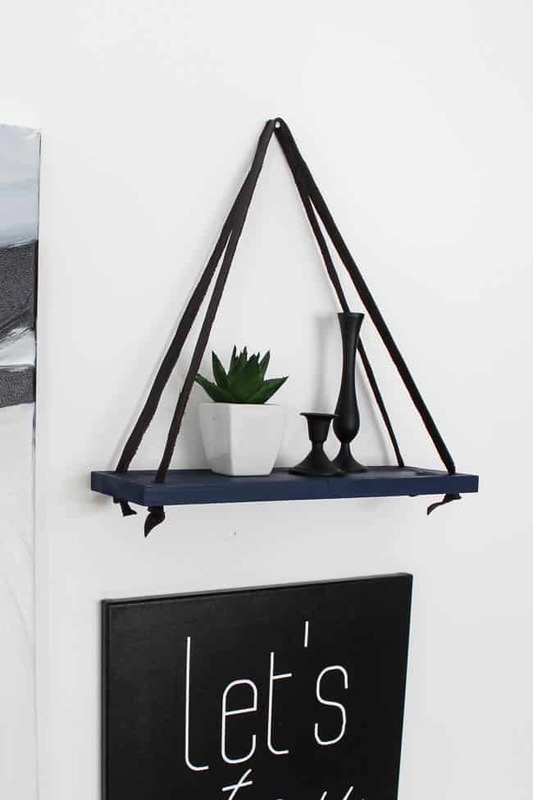 This simple hanging shelf was my favourite piece! 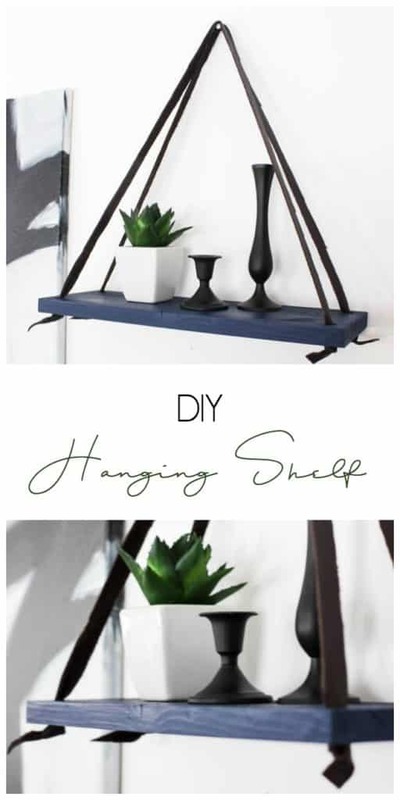 If you have some scrap wood and some leather you can easily make this modern hanging shelf yourself! 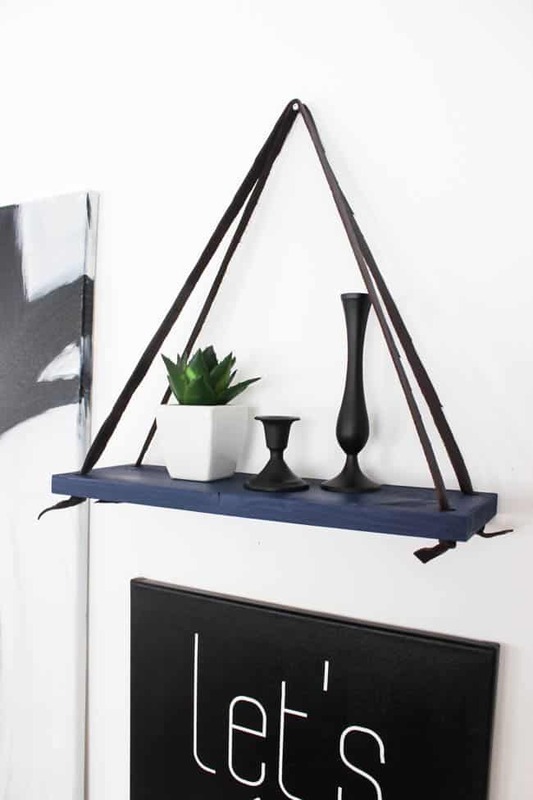 I’ve seen people make similar shelves with rope as well if you want something a tad bit more rustic. We had a scrap piece of pine board leftover from this project. 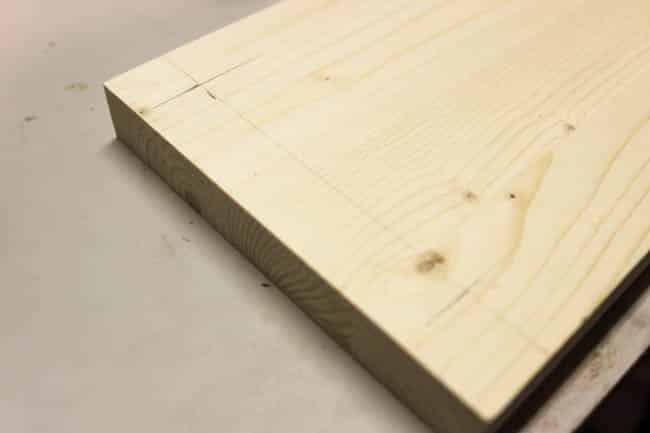 The first step for your shelf is to cut your wood to 5″ x 16″. 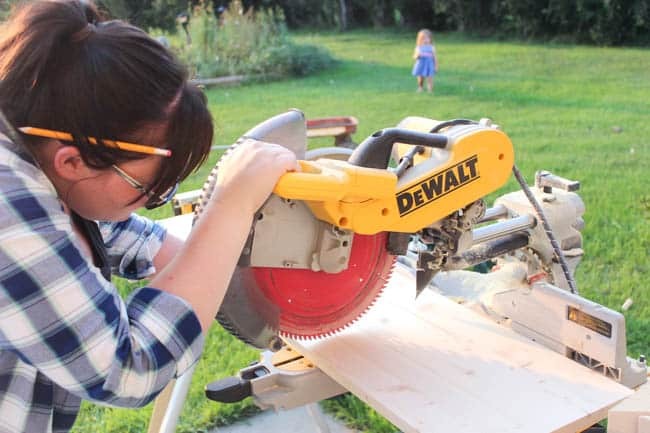 The next step is to measure 3/4″ from each edge and draw a straight line. 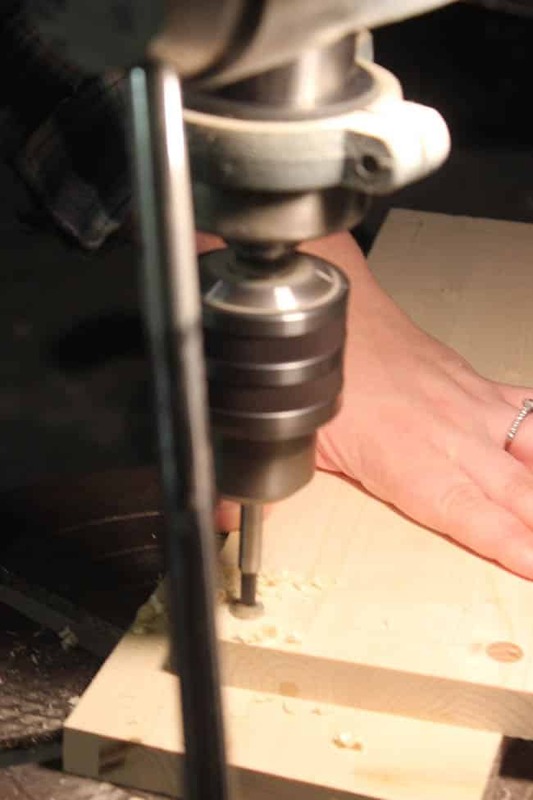 The lines will intersect in the corners 3/4″ from each side to give you an exact spot to drill. 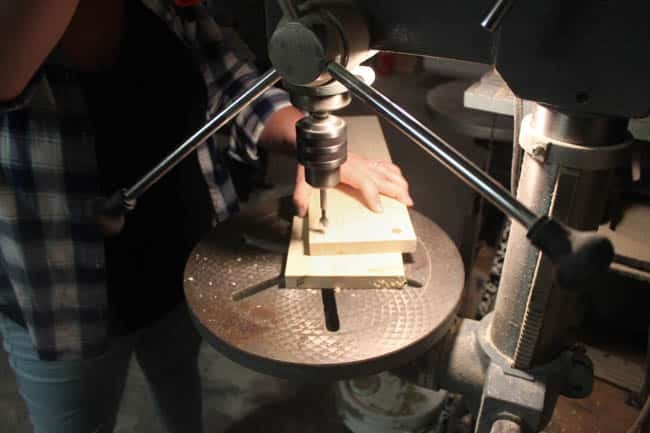 Next, you need to use your forstner bit to drill into the board at the measured spots. 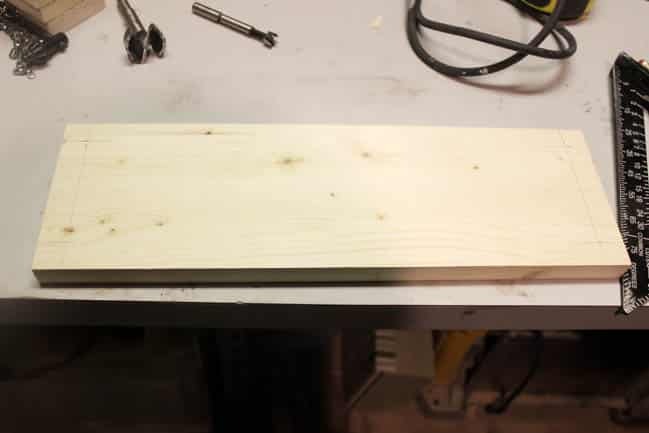 I placed a second scrap piece of wood underneath my board to make sure that the woodon the bottom would not split when the drill bit went through. 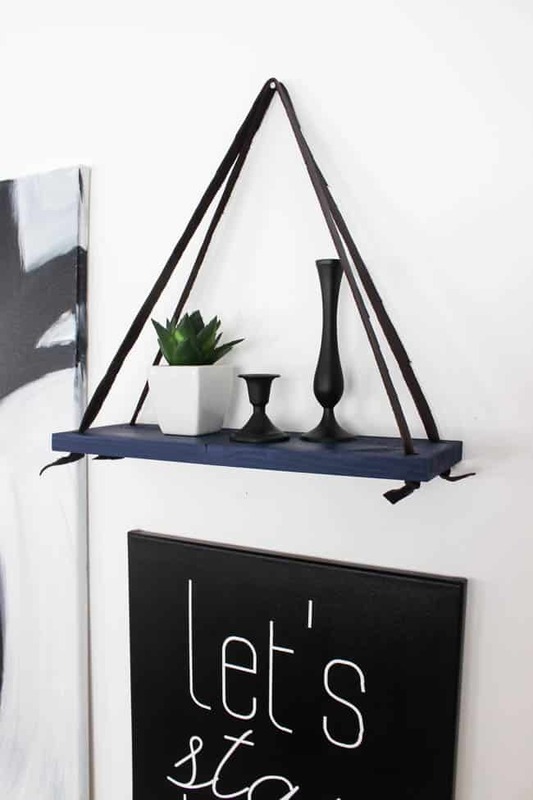 Once the holes are drilled, paint your shelf with your dark blue paint. The final step is to cut your leather. Use fabric scissors to cut leather strips that are approx. 1/2″ in width. One leather strap should be 40″ and one should be 39″ – you need a slightly longer strap to reach the front two holes. 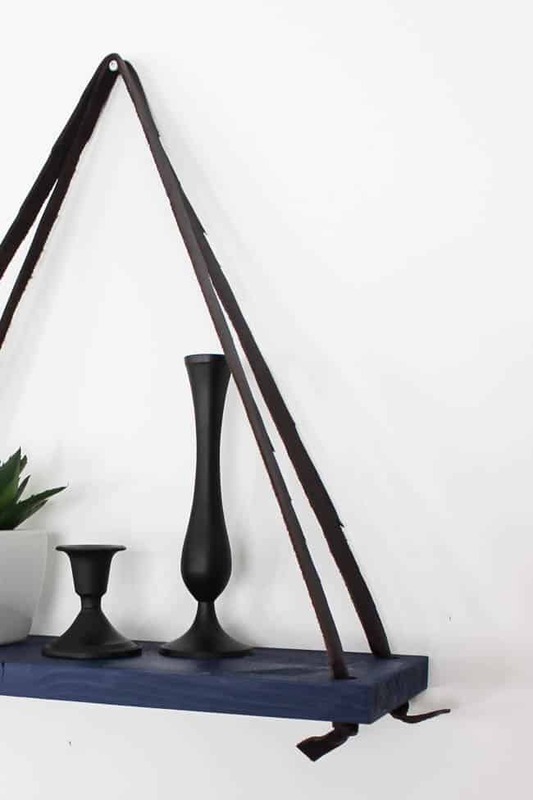 When you assemble this modern shelf you want to weave the leather through the hole and then tie a knot. Mine had approx. 1″ of leather left after the knot that I allowed to hang loose. 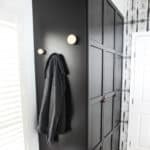 You may want to use a level and hang the shelf against the wall to make sure it is sitting straight – if not, simply adjust the knots down or up slightly. 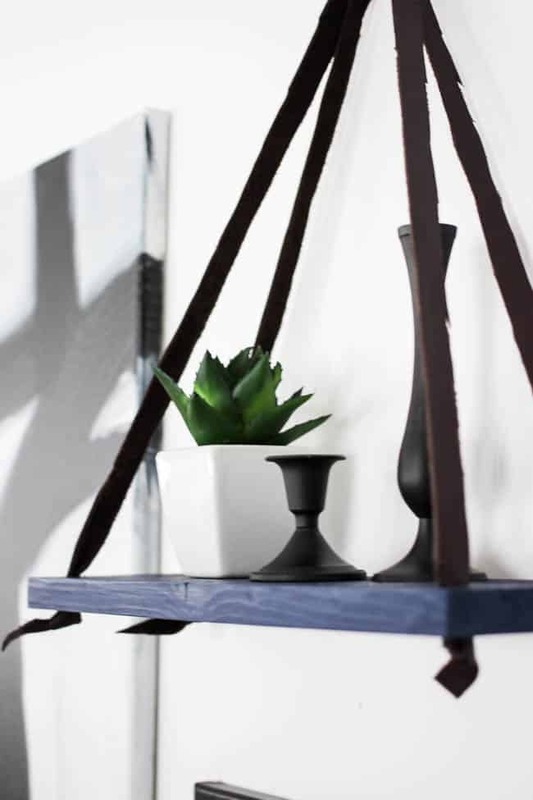 I absolutely LOVE this little modern shelf! I even made a second one (in another colour) that will be revealed in a new room soon (possibly a baby nursery…. lol). 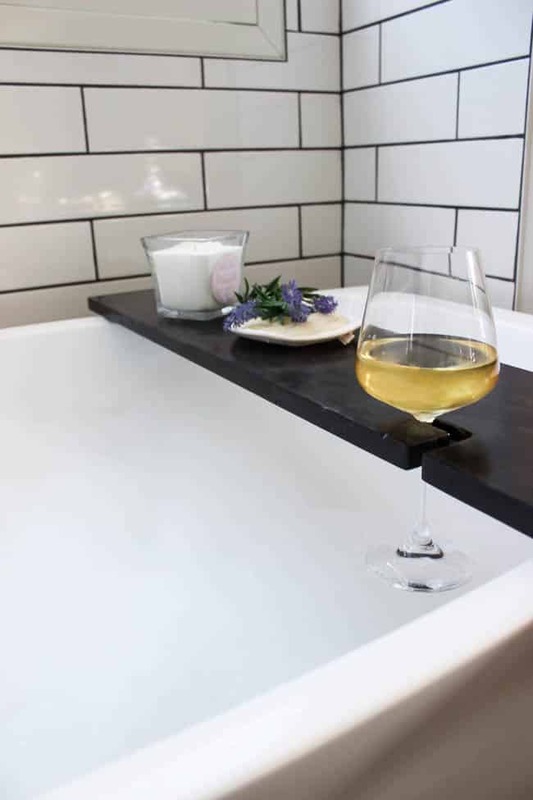 If you need another idea for your scrap wood, why not try this Bath Tray! 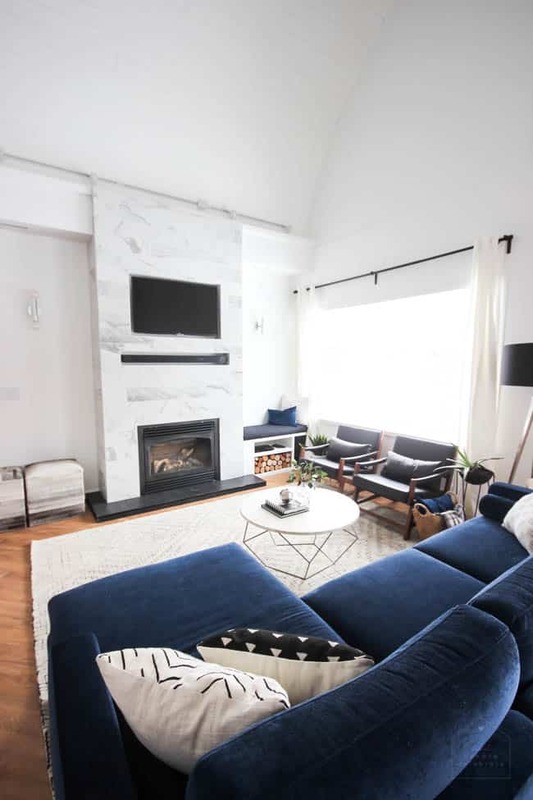 Don’t forget to check out all the features of our finished High Tech Living Room! I love how this shelf looks! I’m definitely saving this post to create one during the weekend. Do you think it’s possible to use a bigger hardwood and create a bigger shelve? And what are your recommendations for securing it on the wall? Thank you for sharing this great masterpiece. Hey! I’m so glad you like the piece! I think you could use a larger board, you would just have to be careful of the weight you put on it. I wouldn’t go too big. 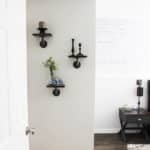 I just hung ours onto a nail in the wall, but you may have to use a plug if you are planning to place heavier objects on top. Hope that helps! This is such a great shelf. Hey! So glad you like it! You may be able to go a bit bigger, but make sure you have a good anchor point, like putting the top nail into a stud, or having a strong wall anchor system. If you go too big it would be harder to balance with anything on top. This size is pretty easy to deep level. Hope that helps! I love the vibe your shelf gives! Its dark blue color looks so elegant. I’m thinking of having one too. Thanks for sharing this :) Wishing you best! I love this idea! 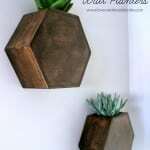 It’s a great way to use the remaining wood. Thank you for sharing! Can’t believe myself that leftover wood could turned into such a great stuff. 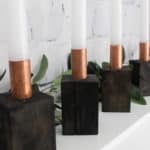 You know it needs god gifted talent to make such a great things.Great idea to share with.Planning to make few as I have some leftover wood in my stock since long and didn’t get any ideas how to use these.Keep posting this types of ideas among us. This is a good one. I love how this shelf looks! I’m keeping this post to create one during the weekend. Do you think it’s possible to use a more significant hardwood and build a bigger shelve? And what are your suggestions for adjusting it on the wall? Thank you for sharing this magnificent masterpiece. 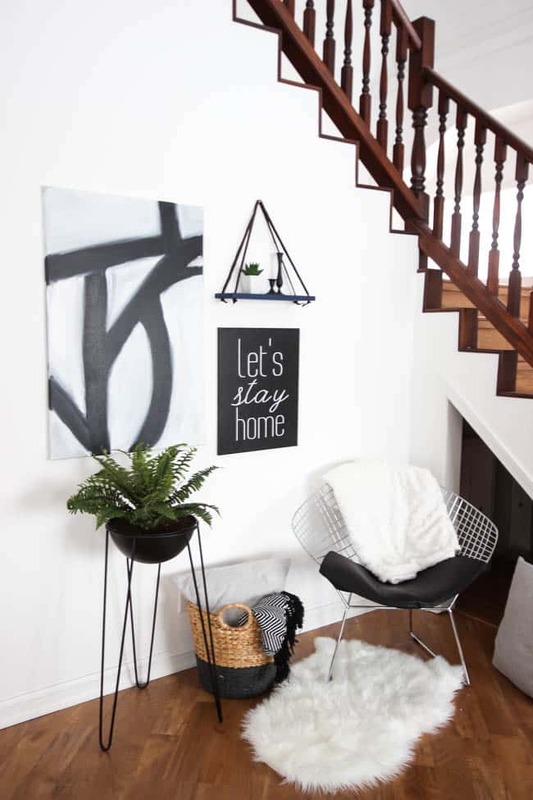 Love love love the hanging shelf! Really digging the navy blue color…can’t wait to make this project. On another note, where oh where did you purchase your beautiful blue sofa? Beautiful job on everything!